LinkedIn is the world’s largest database of business professionals. According to the platform themselves, there are now 500 million business professionals on their network. 100 million of those are daily users, and 40 million of those are in decision-making roles. What's more, of all the B2B leads that come from social media, LinkedIn advertising generates 80 per cent. Those are promising numbers for B2B businesses on the hunt for leads. Much like other social platforms that profit on ad revenue, LinkedIn has a B2B advertising solution that allows businesses to create targeted campaigns based on their ideal budget and desired clicks or impressions. Plus, because it's self-service, businesses can stop their ads at any time or iterate them to optimise for better results. The Ad format for these self-service accounts includes Sponsored Content, Sponsored InMail and Text Ads. If organisations want something a little more hard-hitting and less hands-on, LinkedIn also has a premium range, which offers Dynamic Ads that are part of their account-managed advertising solution, here you get a LinkedIn team member to help create exclusively placed, highly visible ads. In this article, we are going to dive into the self-service solution, giving you a step by step guide on how to generate leads for your business through LinkedIn advertising. Sponsored content - Promote content that is already on your Company Page (good for promoting events, thought leadership articles, good PR, etc.). LinkedIn text ads - Design killer ads to drive readers to your Company Page or website (good for targetting ideal audience and allows you to track conversions). Sponsored InMail - Personalised messages direct to your prospects inbox (good for getting straight to the person you want and delivering them a specific marketing message with a CTA). Video Ads - Create videos to tell interesting stories about your brand (good for engaging brand promotion). Once you've chosen your prefered advertising method, it's time to create an ad. Get a FREE Digital Marketing Review. 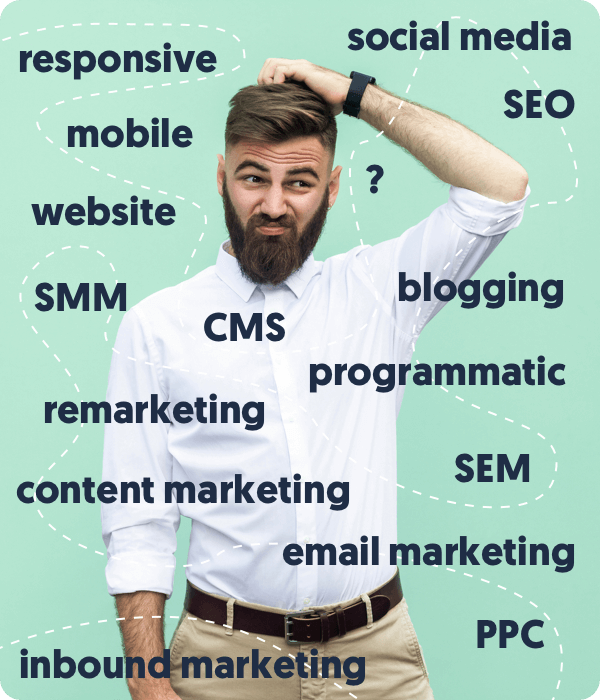 Confused by the plethora of digital marketing activities available? Not sure where your attention should be? Register for a free consultation. Designing an ad is not as simple as whacking up some copy cloned from marketing materials; it needs to be punchy. The headline must capture attention, and the text needs to show expertise without too much jargon. There needs to be a clear value proposition (why should someone click) and a clear call to action (CTA) to move them to a landing page where you can capture them as a new lead. This should all be considered with your ideal audience in mind, what motivates them to action. Imagery is equally as important as the copy. Select images that draw attention while also reflecting your brand. From the campaign manager, businesses can really drill down on the audience they would like to target for their ads. Companies can target by industry, job type, company, skills, the groups that people belong to, location, gender, and age. To test an ad accurately, you need a few options to compare. For this reason, it is worth creating 3-5 (you can do as many as 15 on the platform) different ads, the messaging can be roughly the same but slightly different headlines, images or image sizes, and structure of the content so that you can see what your audience responds best to. Then you have the foundations to iterate according to what generates the best results. During every campaign, there should be someone monitoring and evaluating the progress. LinkedIn allows you to look at stats, such as click-through rates (CTR), and leads, to see which ads are most effective. The beauty of LinkedIn self-service ad solutions is that it can be managed in real time; therefore iterations can be made as you go to optimise performance and boost results. This step should be repeated as often as possible. During, after, always. Advertising is never a set-and-forget tactic. The best results come from the more adaptable marketers able to spot opportunities and iterate to maximise them. If you don't want to spend on B2B advertising, LinkedIn also has great potential for organic leads. Your Company Page is a worthwhile place to invest in your content marketing, as more and more professionals are using LinkedIn’s news feed as a place to learn about topics and trends relevant to their business or job. LinkedIn generates three times more conversations than Twitter or Facebook. Regular posting and analysis of who engages with what content can help you generate organic leads on LinkedIn. Educate: Brand new leads need to be educated about your business, what you believe and why you have content that is interesting to them. Inform: Teaching prospects how to make better decisions and advance their initiatives. Engage: Gaining engagement by sharing relevant content that begins a conversation. Convert: Clearing demonstrating how prospects can engage with you, start a business relationship or make a purchase. HubSpot campaigns help to further segment the leads, creating targeted content to meet them wherever they are in the sales cycle, gently edging them closer to conversion. Blue Beetle is a HubSpot certified digital agency, helping clients with lead generation in Dubai. We can manage the lead generation and nurturing processes. If you're ready to find, nurture and convert new clients, get in touch with Blue Beetle for an in-depth, results-guaranteed strategy. For all your digital marketing in Dubai, Blue Beetle has the experience to support your B2B marketing success.